Most galaxies, including the Milky Way, are filled with giant clouds of gas and dust called nebulae that appear as dark silhouettes against the starry background. Nebulae shine only when illuminated or excited by nearby energy sources. Usually, the energy source is one or more stars. But today at the 204th meeting of the American Astronomical Society in Denver, Colorado, Smithsonian astrophysicist Philip Kaaret (Harvard-Smithsonian Center for Astrophysics) announced that one nebula is illuminated by X-rays from a black hole. Moreover, the brightness of the nebula suggests that the X-ray source may be an intermediate-mass black hole many times larger than most stellar black holes. A rare intermediate-mass black hole powers a 100 light-year-wide nebula in the dwarf irregular galaxy Holmberg II. Weighing more than 25 times the mass of our Sun, this black hole may be a remnant from the first generation of stars in the Universe. Credit: David A. Aguilar, Harvard-Smithsonian Center for Astrophysics. This surprising find offers only the second known example of a black hole-illuminated nebula, after LMC X-1 in the Large Magellanic Cloud, and the first example of a nebula powered by an intermediate-mass black hole. "Astronomers always get excited about new things, and this nebula is certainly something new. Finding it is like getting a royal flush the first time you play poker - it's that rare," said Kaaret. Initially discovered by Manfred Pakull and Laurent Mirioni (University of Strasbourg), the nebula is located 10 million light-years away in the dwarf irregular galaxy Holmberg II. Two years ago, Pakull and Mirioni noted that it seemed to be associated with an ultraluminous X-ray source. By combining observations from NASA's Hubble Space Telescope and Chandra X-ray Observatory with those from ESA's XMM-Newton spacecraft, Kaaret and his colleagues, Martin Ward (University of Leicester) and Andreas Zezas (CfA), pinpointed the X-ray source at the center of the nebula. Moreover, the mystery source is pouring out X-rays at a tremendous rate, shining one million times brighter in X-rays than the Sun shines at all wavelengths of light combined. The observations by Kaaret and his associates indicate that those X-rays are generated by a black hole gobbling matter from a young, massive companion star at a rate of about one Earth mass every four years. That modest accretion rate is sufficient to ionize and light up a huge 100-light-year-wide swath of the surrounding nebula. The X-ray emissions provide an important clue to the nature of the black hole. Some astronomers have suggested that X-rays from the source in Holmberg II and similar bright sources are beamed in the Earth's direction like a searchlight. Such beaming would make the X-ray source appear brighter than it really is, thereby making the black hole appear more massive than it really is. Kaaret's data contradict that view, showing instead that the black hole in Holmberg II sends out X-rays evenly in all directions. Therefore, its brightness suggests that it must be more massive than any stellar black hole in our own Galaxy, weighing in at more than 25 times the mass of the Sun and likely more than 40 solar masses. That would rank it as an "intermediate-mass" black hole. 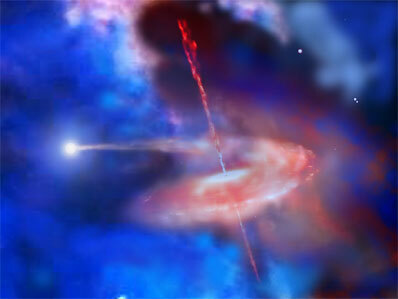 "It's not easy to explain how intermediate-mass black holes form. Since we only have a few examples to study, every new find is important," said Kaaret. This research will be published in a paper co-authored by Kaaret, Ward and Zezas in an upcoming issue of the Monthly Notices of the Royal Astronomical Society.